Electric and self driving cars have grabbed recent headlines in the motoring world but what part will electric bikes play in the transportation of the future? Unless you’ve been living under a rock for the last 13 years you will no doubt have heard of Tesla. Elon Musk took over as Chairman of Tesla Motors in 2004 overseeing the development of the 2 seater Tesla Roadster following his successful sale of PayPal to eBay. Since then Tesla have been grabbing headlines in the electric car world with the launch of the Model S and its infamous “insane mode”, and most recently with the launch of the more modestly priced Model 3. Launched earlier this year, Tesla presold almost 400,000 units in the first weekend. There is no doubt that Tesla has done wonders for the profile of electric vehicles, showing that being 100% electric doesn’t have to be at the cost of style, performance and range. Even more controversial is the topic of self driving or as Tesla refers to it as “Auto pilot convenience features” on its options list. Active safety features have been around in the motor industry for a long time. Mercedes Benz launched the first Anti Locking Braking System on a production car using a system developed by BOSCH in 1978. Since then there has been a steady stream of innovation and three letter acronyms that feature on many of our family cars EBD, ESC, EBA. At the more sophisticated end of the spectrum Volvo launched its pedestrian and cyclist detection system with full auto braking in 2013. In 2017 it will be launching a fleet of 100 self driving cars for testing on public roads in Sweden. Uber launched its trial of driverless vehicles in Pittsburgh USA in September this year and Apple and Google are also rumoured to have driverless systems in the pipeline. WILL THESE INNOVATIONS SOLVE OUR INCREASING CONGESTION PROBLEM? Based on what we know today its safe to say that the use of electric and autonomous vehicles will only increase over the next 5 – 10 years. If this trend continues globally our inner cities will certainly be less polluted than they are today. However, despite recent improvements in journey times in Queensland’s capital, average speeds during peak hour traffic are still as low as 20 KPH in some of the busiest areas. Not much chance to engage “insane mode” in these circumstances! If you had the option you might choose to use an “Autopilot” function to take some of the stress out of your journey but would it make your journey any quicker? In a scenario where all the vehicles on the road are autonomous and connected to one another then is it possible to smooth traffic flow. This will certainly make journey times more predictable, but not necessarily quicker. Research and testing has shown that passengers in autonomous cars prefer a smoother ride, and this generally means more gentle acceleration and braking. This feature becomes more important if people start to use their vehicles as mobile offices or lounge rooms for relaxing and entertainment whilst they are travelling. This leads to more unused space on the roads, and when you add unpredictable non autonomous drivers into the mix, this is likely to lead to even more unused space on the road as your “Autopilot” will be forced to brake in response to being “cut off”. If you’ve been to Europe in the last 5 years, you’ll know what we are talking about. In countries like Germany electric bikes are now outselling traditional bikes. So why is this? While e-bikes haven’t grabbed as many headlines as Tesla, they do share a lot of the same technologies. The top of the range Tesla uses an 85 Kilowatt Hour lithium ion battery weighing 520KG, with a useable range of 400Kms. Electric bikes use the same lithium ion batteries but on a much smaller scale. Bikes using the BOSCH e-bike system use a 0.5 Kilowatt Hour battery that weighs under 3KG. When used in conjunction with a super efficient pedal assist electric motor this allows riders to travel over 100Kms on a single charge, with assisted speeds up to 25KPH. Suddenly this means that distances that might have been too far to ride on a traditional bike, become achievable to almost everybody, regardless of age and level of fitness. It also means that the two enemies of traditional bike riding are no longer a worry. E-bikes flatten out hills with their high torque electric motors (and you won’t even notice those energy sapping headwinds), providing an opportunity for riders to arrive at their destinations fresh and sweat free. The 2012 census showed that that 37% of people ‘s average distance to work was less than 10kms, and a further 24% had between 10-20kms to travel. For those people that weren’t currently riding a bike to work, half of them gave “too far” as a reason for not riding a bike. Other studies have show that rider safety is also a major concern, and prevents a lot of people riding to work who otherwise would be happy to give it a try. With an electric assist, a 10km trip into work on an e-bike can be tackled with minimal effort in less than 30 minutes. E-bikes also accelerate a lot faster than traditional bikes, which makes it easier to get going again after stopping at traffic lights, or junctions. This makes it easier to keep up with the flow of traffic, especially during peak hour. It also makes riders feel safer, and has the added bonus of reducing frustration for other road users. With most of the major car manufacturers either extending their hybrid or electric range, or planning to launch their range in the next 2 – 3 years, electric and self driving vehicles will continue to grab headlines. However, at a fraction of the purchase price, running, and maintenance costs, electric bikes have an important role to play in reducing congestion, especially for single person journeys under 20kms. This fact hasn’t gone unnoticed by the motoring world, with companies like BOSCH and Yamaha already taking a leading role in e-bike drive systems. Audi, BMW, Ford, Honda, Lexus, Mercedes, Porsche, Toyota and VW have all released e-bike models in recent years, which shows that e-bikes are definitely on their radar. What we have seen over the past five years at Electric Bikes Brisbane is that e-bikes have definitely encouraged more people to leave their car at home. Particularly since Queensland adopted the new European Standard allowing the more powerful 250 Watt motors back in 2013. More and more two-car families are ditching one of their cars in favour of an e-bike and we are also seeing school leavers opting to get an electric bike instead of a car, some determined never to buy a car! As a form of transport this generates significant financial savings (around $150/week) but our e-bikers are also getting fitter and healthier because they are building light exercise into their daily routines. This has enormous additional benefits for our health and community welfare. With the increased focussed of governments on safer bicycle infrastructure electric bikes will – or should – play an important role in transport and active living. 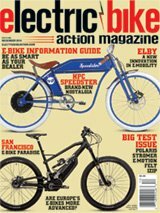 This article is courtesy of Electric Bikes Brisbane.